No matter where your imagination takes you, the Ellageo Plus delivers. The Automatic Fabric Sensor System adjusts the presser foot pressure for fabric thickness as you use any of the 358 stitches. And when embroidering, you get the convenience of editing designs on your machine and transferring them back into your computer through a USB thumb drive. 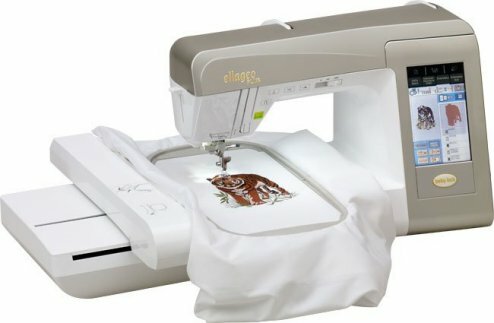 The Ellageo Plus is an innovative machine that will add luxury to all of your sewing, embroidery and quilting projects. Edit designs on your machine and transfer them back into your computer, download upgrades, and more. With the conveniences of a Baby Lock, the Ellageo Plus will change the way you feel about sewing and embroidery. This easy-to-read touch screen makes changing your machine’s settings simple, and the color LCD screen allows you to edit your designs while distinguishing between thread colors. Easily transfer designs to and from your PC. Build your design library with edited designs, save and access designs on your computer, download machine upgrades and more! Edit your designs effortlessly with the Ellageo Plus. Use the color LCD screen to rotate, resize, and combine your designs, or use the character/text array function to give designs the exact look you’re going for. The built-in library gives you an amazing selection of 197 built-in designs that will make all of your projects unique, including 115 designs created exclusively for Baby Lock. The Ellageo Plus gives you the ability to arrange your text and combine it with your designs on-screen. Give your projects a personalized touch with 11 font styles to choose from, including one exclusive script. Add a personal touch and versatility to all of your projects! Choose from 358 built-in stitches, including 107 utility stitches (with 14 styles of one-step buttonholes), 58 combinable utility stitches, 142 decorative, 23 wide satin, 14 satin, and 14 cross stitches. Bobbins are a breeze with the Quick-Set, top-loading bobbin, which comes with a clear cover.